Record 35 Students combined during both sessions tonight during the club competition- 31/3/2015 matched on the 8/12/15 during a normal lesson. Expect more records to be broken this year, also the most students joining in the month of January. Most students joined in one month, fantastic thanks for everyone's support! We have already had more new members so far this year than the whole of last year! 52 new members so far this year, 18 last year. The following award was voted by the students. On the 7th November 2015 we hosted a course delivered by Sensei Peter Manning 7th Dan and Sensei John Euden 6th Dan of the TSKA. The course was attended by members of Junsui Shotokan Karate Do who also invited students from other clubs in the local area. Sho Shin Kai Thornley/Trimdon and Kyokutan Karate Darlington sent students to attend. Sensei Steven Beresford 4th Dan welcomed everyone to the course and introduced Sensei's to the attendees. Sensei John Euden took the warm up and then the class split into lower and high grades. 6th Kyu and below trained with Sensei Peter Manning for the 1st hour and 5th Kyu and above trained with Sensei John Euden. After an hour the course had a break for 15 minutes and then changed instructors. Sensei Peter Manning took the 5th Kyu and above and Sensei John Euden the 6th Kyu and below. The course entailed fine tuning the basic moves and stances with excellent explanations of each move and the reason for doing so. Sensei's explained each move and showed the effectiveness of the technique, students paired up in each session working on Ippon Kumite for the high grades and Sanbon Kumite for the low grades. Partner work was also used for combinations after performing the combination students partnered up to run the combination through for defence and attack. The course was full of clear and precise instruction and delivered in a friendly warm way but maintaining the emphasis of the martial way. For the final hour Sensei Steven Beresford took the younger students for breakfall and takedown practice whilst the older students stayed with Sensei's Peter Manning and John Euden for some practical Karate for real situations. Sensei's again delivered with clear to the point instruction showing techniques which have been learnt through experience and tested for effectiveness. Everyone enjoyed the course and were full of compliments for Sensei's Peter Manning and John Euden with floods of questions when can we do this next. We were very privileged to have had this opportunity and thank Sensei's for their time and tuition. After the announcement of the closure of Durham Gilesgate Youth and Community Association I quickly worked towards finding a new venue for the club. We have moved to Laurel Avenue School, which has excellent facilities. I hope everyone continues to support the club and we continue to see the fantastic growth we have this year. I will of course review in the new year. First lesson Sunday 4th October. Lisa Hope, Peter Hope, Ethan Hobson, Lewis Carter, Charlie Harrison, Ellis Jones, Lexie Peppersmith and Jack Ogden. Charlotte Hedley, Robert Song, Jamie Song, Teagan-Leigh Wright and Karl Sichert. Michelle Bestford, Zachary Beresford, Michelle Gunton, Vincent Shepherdson, Lee Shepherdson and Phoebe James-Holland. Junjun Qin, Ruixuan Li, Taylor Dunn, Hannah Potvliege and William Potvliege. Kim Hedley, Michael Hedley and Lianne Hedley. Kasey Mickle, Daniel Bell, Simon Mathias, David Mathias, Peter Mathias, Kevin Yang, Harry Brown and Ben Vickers. Jack Strangward, Lucas Gamble, Mia Gamble, Owen Alderson, Evan Alderson, Mark Phelps, David Mason, Maeghan Mason and Isla Scott. We have now reached our 100th Member, welcome to Lianne Hedley who will receive her membership, 1st grading, club t shirt and 10 lessons all free. 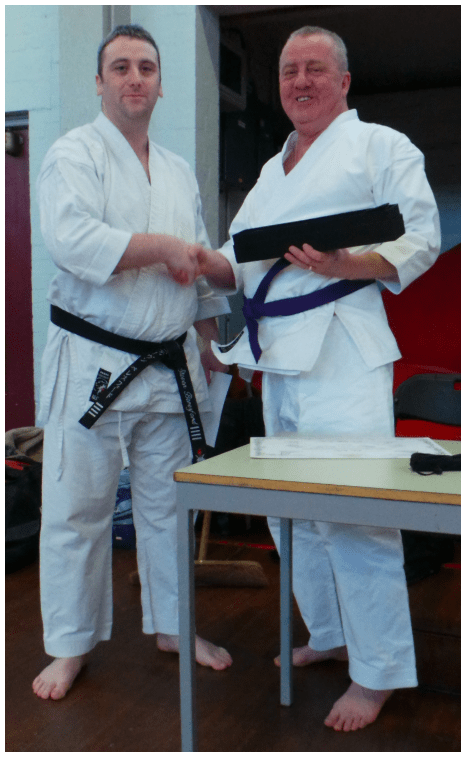 During the Easter Competition I presented John Malia his honorary Black Belt, John had been seriously ill for a number of months and I never expected John to return to training. John has supported me over the last year training the little tigers and also has taught me valuable knowledge in dealing with different abilities and has been a mentor for me and an inspiration. Well done John you deserve it. John has returned to training and I wish him well in now reaching the goal of his full Black Belt.